The veteran actor reflects on coming to terms with playing drug kingpins while striking a balance on representation. Esai Morales, 55, started his acting career playing the bad boy Paco Moreno in the movie "Bad Boys," opposite Sean Penn. This year, the Brooklyn-born Puerto Rican actor returns to the big screen starting opposite Trevor Jackson in "SuperFly," which opens in theaters Friday. The film is a remake of the 1970's classic "Super Fly." It follows Priest, a cocaine dealer, who wants to score one more super deal before retiring. Morales' character, Adalberto González, is an ambitious head of the Mexican drug cartel who sees what Priest is capable of and makes him an offer he can’t refuse. “Adalberto is a very calculating man. He sees this young, charismatic man as the way to up his own game, to make more money,” Morales told NBC News. Morales is no stranger to playing a Mexican drug cartel leader on screen. His character in the new hit Netflix show "Ozark" was the number two guy in a drug cartel from Sinaloa, Mexico. "As the world changes, some things never change, because as a Latino, we are always in demand for playing the bad guy,” Morales said. Over the years, Morales has come to terms with playing drug dealers and other criminal elements, especially now that cartel bosses have been major movie characters. 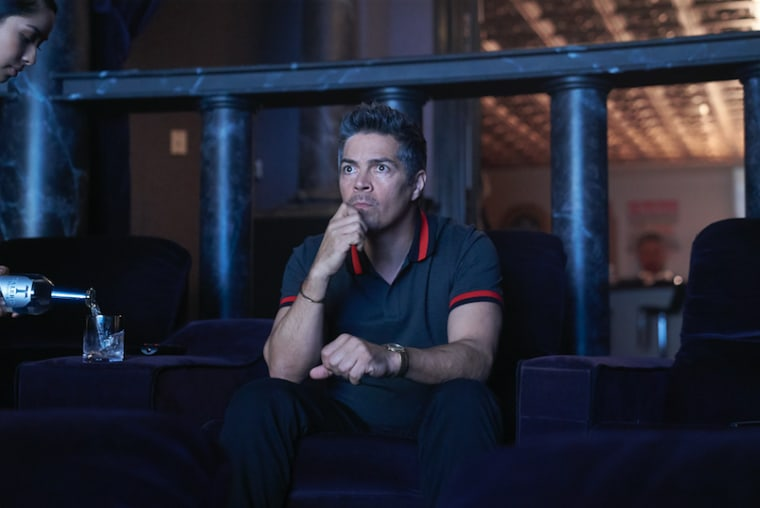 Although he finds the so-called bad boy roles "more fun" to play, Morales said it's important to strike a balance in the kinds of characters Latino actors play on screen. "It's more fun playing the bad guy than being one, but the good thing is that I have played the president of the United States in 'The Brink,’” Morales said, referring to his character Julián Navarro. Latinos attend more movies per capita than any other U.S. demographic group, according to the Motion Picture Association of America. Yet Latino actors only appeared in 2.7 percent of movie roles in 2016, while Asian and “mixed” actors appeared more on screen with 3.1. percent, and 3 percent, respectively, according to the 2018 Hollywood Diversity report from the Institute for Research on Labor and Employment at UCLA. Morales knows his success stands out and is a source of cultural pride. Known for his roles in movies and TV shows such as "La Bamba," "Criminal Minds" and "How To Get Away With Murder," Morales was honored as the Grand Marshal at the 61st National Puerto Rican Day Parade on June 10, in New York City. It was the first parade after Hurricane Maria wreaked devastating damage to Puerto Rico.